Florida State has sent 281 players to the National Football League since 1951.[when?] This includes 47 first-round draft picks. 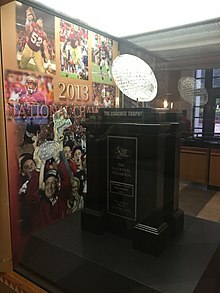 Jameis Winston holds the record as the highest Seminole taken in the NFL Draft as he was selected with the first overall pick by Tampa Bay in the 2015 draft, the highest by a Florida State player since Andre Wadsworth was selected third overall by the Arizona Cardinals in 1998. Eleven players, a school record, were taken in the 2013 NFL Draft, a record tied in 2015. Florida State had 29 players drafted over a three-year period from 2013–2015, the most of any team in the modern draft. Seventy-two former players have gone on to play in the Super Bowl and eighty-three former players have been selected to the Pro Bowl.[when?] Three former Seminoles (Derrick Brooks, Warrick Dunn and Anquan Boldin) have won the Walter Payton Award while two (Fred Biletnikoff and Dexter Jackson) have been named Super Bowl MVP. Wikimedia Commons has media related to Florida State Seminoles football.